Raloy RF117HD rack console with an Over-IP KVM features a 17" Widescreen LCD capable of full HD 1080p video and an integrated single or multi user KVM switch. This state-of-the-art modular rack console offers a space saving, streamlined approach to your rack environment by integrating your LCD monitor, KVM switch, Keyboard, Mouse, and Audio options into one unit taking up only 1U (1.73 in.). Raloy IP KVMs are offered in 2 styles: High Density CATx, or Basic DB-15. 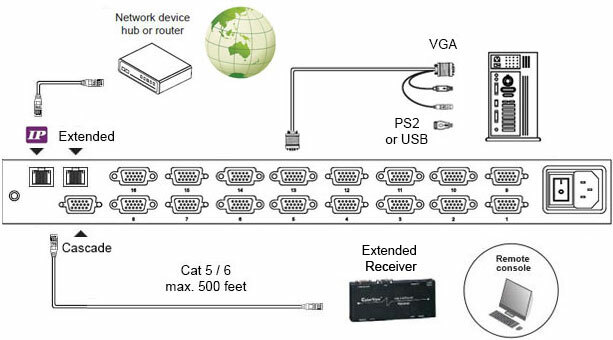 DB-15: 6ft DB-15 VGA 4-in-1 cables included, with connections for PS2 and USB servers (p/n RCE-6). RF117HD-CATx Back & Extended Application. 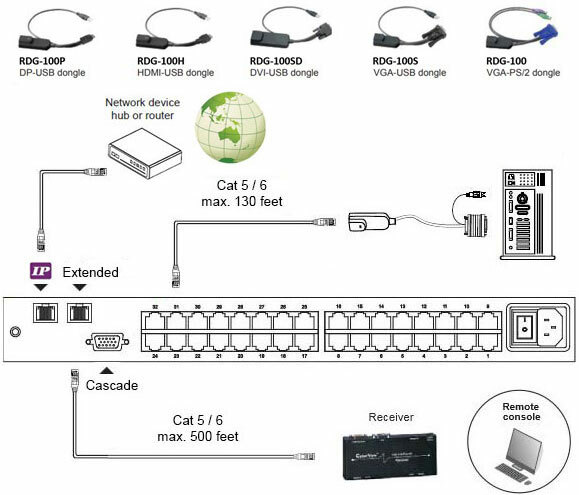 RF117HD-KVM Back & Extended Application.